Now, it’s funny that I remember The Remains of the Day from high school as the boringest-looking movie of all time. A butler goes on a driving trip of the English countryside to revisit a housekeeper he once loved, played by Anthony Hopkins and Emma Thompsen. Actually, 25 years later it looks preeety good, and I think I remember my mom being very jazzed about it, but as a punk-rock teen, not so much. 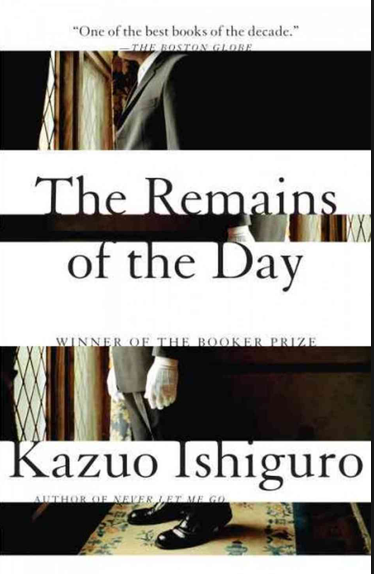 Which now is even funnier because this is a dark, nasty tale with a brilliant experimental usage of voice and one of Ishiguro’s trademark sliding reveals, where the tale takes shape, deepens and gets more disturbing with each tightly crafted chapter. It’s the very furthest thing from a feel-good story about a butler in love, and is enjoyable only in the punk-rock way that there’s a wicked, awful thrill in some of the terrible things it says about humanity. If I have a criticism, which I don’t, really, it’s that he misses an opportunity to make the female lead quite as complex as the male.